We hope you enjoy the song, please tell your friends, your dogs, cats and any neighbourhood bats and remember, the song is a dedication to one of Britain's great artist's whom we knew personally from old whitstable town. We will always remember how he carried himself, like he was in another era, like he was one of the last of that rare breed "The English Gentleman" which he was, Shine on! We bumped into these guys one dark, foggy Whitstable night, but Mr Cushing sorted them out for us! (C)Jellybottys Dot Com. All Rights Reserved 2015. 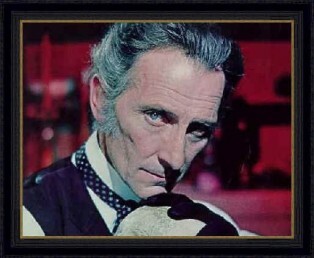 Mr Cushing at his enigmatic best! 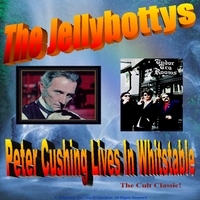 To coincide with the very exciting news that the "Peter Cushing Lives In Whitstable Song" has it's own special featurette section on the Q.I. TV Show series 'C' DVD release, hosted by Stephen Fry and Alan Davies, The Jellybottys have released their own 3 Track EP/Single of the Song also. Download the EP or Single MP3's Above!